The early church had just suffered its first setback. After healing the lame man at the temple gate, Peter had preached Jesus to the receptive crowd and many had believed in Him. This greatly bothered the Jewish rulers, who thought that with the crucifixion, they would be done with this Jesus troublemaker. The Sadducees, priests and temple captain arrested Peter and John, kept them in jail overnight and the next day brought them before the Sanhedrin. There the rulers, elders, and scribes, along with the High Priest, grilled Peter and John, commanded them to stop teaching in Jesus' name or else, and let them go. 1. They begin with praise—focusing on God's greatness - Acts 4:24. 2. They remind themselves, and God, of His word and promises by quoting scripture - Acts 4:25,26. 3. They speak their agreement with God's will and His sovereign purposes: "… to do whatever Your hand and Your purpose determined before to be done" - Acts 4:27-28. 4. They request, not that the persecution will stop or that the persecutors will be silenced (like I would) but that they will face these threats with boldness. 5. They pray for more healings, signs, and wonders to prove Jesus' power and reality. The result of their prayer: "… the place where they were assembled was shaken (literally, I wonder, in an earthquake-type event?) 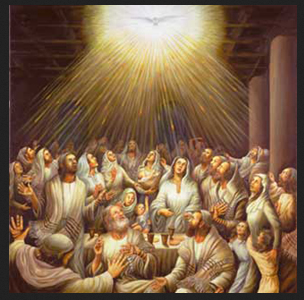 and they were all filled with the Holy Spirit, and they spoke the word of God with boldness." PRAYER: Dear Lord, I need this boldness not only when I face opposition, but for everyday life. Please fill me with Your Spirit in this way. Amen.